Food Fare's Soups & Stews Cookbook contains more than 170 recipes for unique as well as traditional soups and stews from across the globe. The Soups & Stews Cookbook is available in Kindle, Kobo, Nook and PDF editions. Select your preference and get cooking! Take a look inside the Soups & Stews Cookbook with our exclusive screenshots. 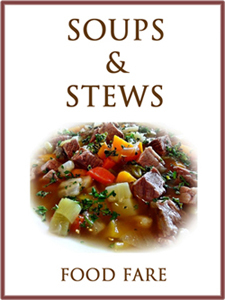 See a complete list of recipes in the Soups & Stews Cookbook and view free samples.